Quick security checkup: which of these five mistakes do you make when creating a password? It's bad enough when a data breach reveals your personal data. It gets worse when the hackers can grab your whole family tree. A security breach at the MyHeritage genealogy site leaked the personal details of 92 million users. A movie whose plot is determined by the real-time reactions of its watchers has been created by an English professor. Not so smart… An “unlikely” chain of events led Amazon’s artificially intelligent Alexa gadget to record a family’s private conversation and send it to a random stranger. 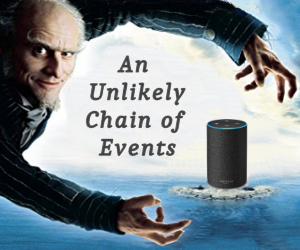 Amazon spokesman Lemony Snicket says they're working on the problem. Godwin's Law says that as an online discussion goes on, it becomes more and more likley that someone will make a comparison to Hitler. So imagine an artificial intelligence that can predict whether an online discussion is about to erupt into personal insults and head off the nastiness before it starts. Well, here it is. This just in from the "Don't Be a Square" department: Samsung and Apple have been locked in what Steve Jobs called “thermonuclear war” over a phone’s round corners since Samsung launched its Galaxy phone in 2010. Last week, a new jury found Samsung owes Apple $539 million. Samsung is hinting at yet another appeal. The EU’s General Data Protection Regulation (GDPR) contains a prohibition against “forced consent,” in which a company offers a user only the “choice” of accepting all of the company’s terms of service or losing access to its services. The first “false choice” lawsuits have been filed against Facebook and against Google Android. "And out your window on the left side of the aircraft, you'll see…" Airplane windows are destined to be replaced by high-resolution video displays of what’s outside each vantage point on a plane. Robotic orange road cones on rollerskates scurry to where they are needed and get out of traffic’s way faster than the old method of picking them up one by one. Video of a snake-like firefighting tool that flies on water jets is cool in theory, a bit lame in actuality. But the tech works and will surely be improved. Facebook groups enable trafficking in endangered species, live specimens, and parts. One group of conservationists found a way to create an international complaint that will force Facebook to crack down on trafficking. The popular “Guitar Hero Live” streaming service will go offline in December, rendering 92% of the tracks users downloaded unplayable forever (or until a hero hacker posts a fix). Most recent comments on "Geekly Update - 13 June 2018"
Concerning the "Alexa" text, from the article I read (no reference article was attached to your paragraph) it was no random stranger who received the Alexa message. It was someone on their contact list, which they pre-loaded to Alexa. This is a darn good reason to NOT allow Alexa access to your contacts. Once you do, there's no easy way to undo it. "An “unlikely” chain of events led Amazon’s artificially intelligent Alexa gadget to record a family’s private conversation and send it to a random stranger. " It' wasn't QUITE that bad; it emailed it to somebody in their contact list, not to a "random stranger". However, my caution against such unlikely events is why I don't own an Echo device, even when Amazon offered us one for free. Because there are no "Internet of Things" devices that are self-contained; they ALL communicate with some server in the "cloud" and all the signal processing is done THERE. What's more galling than the MyHeritage breach? Equifax sending me e-mails every other day offering to protect my identity. For a modest fee, of course. Interesting bit about ZTE! Don't we remember something about that firm being offered relief by our President, or am I thinking of some other Chinese acronym? Please evaluate PC MATIC white list scheme vs black list scheme for anti virus, anti malware, anti intrusion etc. "Amazon spokesman Lemony Snicket" REALLY?????? EDITOR'S NOTE: A little joke. I saw the similarity between "A Series of Unfortunate Events" and "an unlikely chain of events" and decided to have some fun with it. The homeopath story doesn't show anyone falling for his nonsense except 500 patients, and certainly not the state medical board. I wonder who those 500 people voted for for President. Just sayin'. One more person here pointing out that there was nothing “random”or “stranger” about the Alexa event. The voice assistant mistakenly interpreted some words, including a specific name of one of the family members’ contacts. That definitely doesn’t fit the definition of either “random” or “stranger.” While it is not exceedingly uncommon for an assistant to misinterpret words, the unusual part of this story is the linked chain of misinterpretations leading to a message being sent. Then again, pocket dialing, mistakenly accepting rather than rejecting a call and not properly hanging up a phone have all led to contacts hearing conversation not intended for them. There are numerous examples (some high tech and some very low tech) of how conversations/messages can end up in unintended places. If my ZTE is Android 4.1 not 4.2-6 so does this article not apply to my phone? I have never noticed any pop-up ads and only use the phone for calls and texts. I am considering getting a new phone, possibly an iPhone. Could my use of the phone be causing problems to the people I call? Can I ask for recommendations for a phone for a non-tech savvy senior, easy to use, mainly for calls, texts and ability to take and email photos easily? Please edit or delete if my request is inappropriate. I have been reading since the TourBus days. Thanks Bob, and any reader suggestions. I find it difficult to understand how a jury could find in Apples favour in the lawsuit against Samsung. I can only assume that the members were all halfwits or bribed. Apple didn't invent any of the things that the lawsuit was based on. It is all as stupid as Cadbury being allowed to copyright the colour purple. ....and who did those 500 vote for? They must have heard something compelling about voting for Hilarity buried subliminally in the hissing. Just speculating.